Multiplication Poll: * or · or something else? / Multiplication Poll: * or · or something else? Poll: Multiplication sign in 2D mode? In non-2D/text editor? RE: Multiplication Poll: * or · or something else? (04-12-2014 06:44 AM)Joe Horn Wrote: The HP-38G, "Elsie", has a [*] key instead of a [×] key. Is that the one you're thinking of? That is the one. 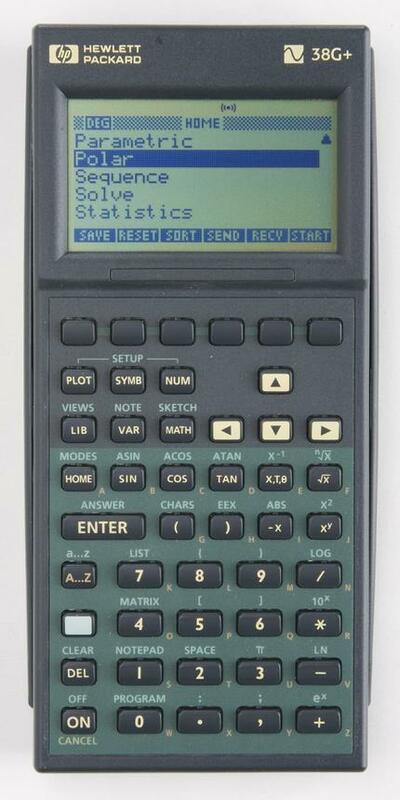 The lowly HP-38G is the only calculator to get it "right". (04-12-2014 02:03 PM)Mark Hardman Wrote: The lowly HP-38G is the only calculator to get it "right". Unfortunately it has an x^y key instead of **, as real programmers know it should be. Today's bonus factoid: In Prime's CAS, ** can be used as an alias for x^y. (04-12-2014 12:56 PM)David Hayden Wrote: The problem with "∙" on a key is that it can be confused with the decimal point (at least in countries that use a dot). And the problem with × (multiply sign) is that it can be confused with the letter x. So maybe * is the best choice. Maybe it will turn out that way. And there are internationally agreed fixed symbols (hurrah!!) for additions, subtractions, for dot (scalar) products and cross products. (04-12-2014 01:48 AM)Mark Hardman Wrote: Interestingly, the still unnamed handheld calculator also uses the "*" for "the key". The HP-38G, "Elsie", has a [*] key instead of a [×] key. Is that the one you're thinking of? No wonder I was puzzled. I've never used or even held an HP-38G. But this quiz did help me to organize a portion of my collection, so thanks for that Mark. As a diversion from the pressing issue of unimaginably incorrect "national US-American customs", can you name the model with the different multiplication key? (04-14-2014 01:40 PM)Eddie W. Shore Wrote: Beautiful collection! Thanks! You should see her mother. Quote: That is the one. The lowly HP-38G is the only calculator to get it "right". ....and FWIW the 38G+ also had the "*" as well.....but it was cancelled before release. (03-07-2014 06:53 PM)Tim Wessman Wrote: How about a poll: Would you prefer to see ·,* or something else for multiplication in 2D display mode? What about the program editor, notes/text, or non-2D mode? I voted for * for the program editor as this is what nearly every programming language uses. The 1D display should be consistent with the program editor. I teach in Kenya at an American curriculum high school. American elementary school textbooks generally use × for multiplication till around grade 6 or 7. When the concept of variables are introduced, they switch to using a dot to avoid confusion with the variable x. We would definitely not use × in Algebra or beyond. That said, one of my top students several years ago initially failed our math entrance exam because she didn't know what the multiplication dot meant. She was an 11th grader coming from a British curriculum school in Tanzania and had never seen it before. I've heard the same thing from other British/Kenyan students. I've seen some Kenyan textbooks use the center dot for the decimal place (3·14159). I've always thought the * looked so out of place in the Prime's 2D display. To my American eyes, it ought to be a dot. I'm curious if the centered dot is still used as a decimal point in schools in the UK. If it is, then I would qualify my vote by saying that I'd prefer the dot, but for the sake of others, the dot should be used only if it's optional. I know this thread is old, but I saw it only today searching for something else. The SI (the international system of units) defines as the only accepted symbol for the multiplication between two numbers the cross. See the complete SI brochure on page 134 (english) or 45 (french). I really don't see why we should use something different if it is already internationally defined.